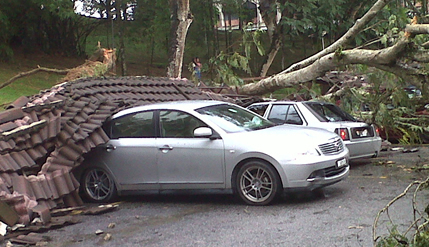 BANGI , 22 Nov, 2012 – Compensation will be paid to staff and students of The National University of Malaysia (UKM) whose vehicles were damaged by a falling tree following a heavy downpour at a car park near the Chancellor Tun Abdul Razak Hall (Dectar) here on Nov 12. UKM Vice Chancellor Prof Tan Sri Dato’ Wira Dr Sharifah Hapsah Syed Hasan Shahabudin gave the assurance today that victims of such natural disasters are covered by insurance provided jointly by the university and an insurance company. The insurance company will calculate the losses suffered after inspecting the vehicles, she said when opening the Seminar and Workshop on A Sustainable Campus 2020 in Bangi. In the incident, a large tree on the slope adjacent to the hall was uprooted in during a heavy downpour falling on a covered padestrian walkway which fell onto the cars parked there damaging 25 vehicles. Eighteen of the cars were owned by staff and students of UKM while the rest belonged to visitors. Fortunately there were no casualties in the mishap.